The Thousand Islands are a group of over 1,800 islands that mark the border between the United States and Canada in the Saint Lawrence River. 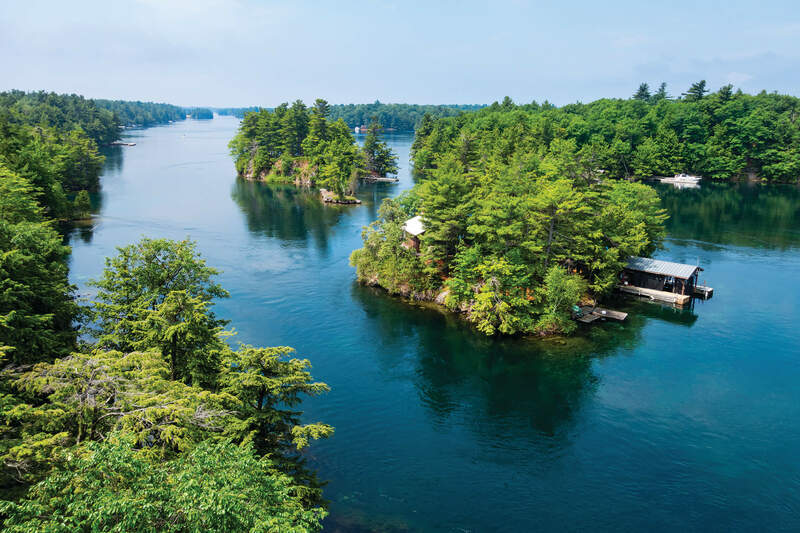 To officially qualify as an island in the Thousand Islands, the land must have at least one square foot of earth above water and support at least one tree. With over 1,800 islands, there are sure to be some stories to unearth. Here are just a few weird facts about the Thousand Islands! In 1900, George C. Boldt, the proprietor of the Waldorf-Astoria Hotel, began construction on a luxurious castle on Heart Island. He meant for the castle to stand as a monument to his love for his wife, Louise. Over the next four years, hundreds of people worked to build the six-story building, which included tunnels, a drawbridge, Italian gardens, and 120 rooms. But in 1904, Louise suddenly died and a heartbroken George demanded that work be halted on the castle immediately. The unfinished building lay in ruin and disrepair for decades, falling prey to the elements and vandalism. In 1977, the Thousand Islands Bridge Authority bought Heart Island for one dollar and restored the castle. Today, you can visit the castle and take a tour. You can even have your wedding ceremony near the dovecote! It’s no surprise that Thousand Island dressing originated in the Thousand Islands region. But there’s a dispute over who really came up with the recipe. One version of the tale involves our old pals George and Louise Boldt. Rumor has it that they were out yachting one day and forgot to bring salad dressing for their lunch. (What a hard life!) So George whipped up something with ingredients they had on hand: mayonnaise, ketchup, relish, hard-boiled egg, and Worcestershire sauce. A sauce is born. But a lot of locals don’t believe this account. A fishing guide, Allen Benas, bought the Thousand Islands Inn in 1972 and found a faded piece of paper in a safe with the words “Sophia’s Sauce” scrawled at the top. It looked a lot like the recipe for Thousand Island dressing. Sophia and George Lelonde owned the restaurant inside the inn in the late 1800s. According to this version of the story, Sophia would make her secret sauce and serve it to fishermen passing by on the St. Lawrence. And this is how the sauce recipe made its way to the Boldts. A mystery if there ever was one! While there are several castles that dot the waters of the St. Lawrence River, the Singer Castle on Dark Island is perhaps one of the most interesting. Singer Castle was originally called “The Towers,” but today it gets its name from its original owner, Frederick Bourne, who was the fifth president of the Singer Sewing Machine Company. 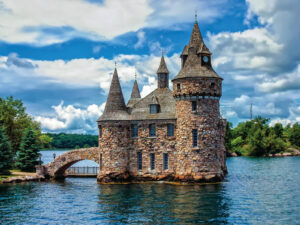 The castle was built around the same time that Boldt Castle was being constructed, and while it’s much smaller—just four stories and twenty-eight rooms—it has secret passageways, a dungeon, and underground tunnels. In the library, there is a secret panel that connects two hidden passageways. At one time, the only way to move the panel was by pulling one particular book from the wall. In the drawing room, one of the portraits tilts back into the secret passageway behind it so that whoever is behind it can spy on the people below. This castle was also featured in the 2000 movie The Skulls. The film was based on conspiracy theories about Yale’s secret society the Skull and Bones. For a somewhat hefty fee, you can stay in the Singer Castle’s Royal Suite for a night and have the castle to yourself! In the movie The Skulls, the secret society is shown at Singer Castle. The truth is, the Skull and Bones do own an island in the Thousand Islands. But it’s not quite as glamorous as Dark Island. Yale’s secret society owns Deer Island, which was beautiful a century ago, but now it’s basically a “dump,” according to one bonesman. There’s only one habitable building on the forty-acre island, which is used for retreats for past and present members. There are other structures on the island, but they’re just the burnt-out stone ruins of what used to be buildings. Since there are almost 2,000 islands in the Thousand Islands, it’s not surprising that there are some, well, uniquely named pieces of land here. For instance, there’s an island that is simply called That Island. They must have really been running on empty for that one. There are five Blueberry Islands and one Willie Nelson Island. In 1964, the TV show The Price is Right gave a contestant an island that was named—you guessed it—The Price Is Right Island. Some islands go by numbers: Island 53, or Island 101K. But one of my favorites is probably Cat Box Island. If it’s your first time or your hundredth time to the Thousand Islands, there will always be something new to discover. You can see these places yourself on our St. Lawrence Seaway & French Canada cruise that leaves next fall.